Plenty of places are all to ready to tell you who’s gonna be the next big thing in 2009 – just check some of the tips from last year to know these need to be taken with a pinch of salt, or the Terris Factor as I like to call it. Basically, unless these artists already have the albums in the can, it ain’t that easy to say that they can turn a couple of great live gigs and a promising demo into something worth cherishing. Many bands fall at the first hurdle. 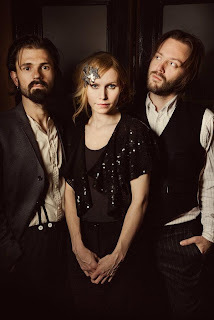 The 2001 eponymous debut A Camp album featured The Cardigans’ Nina Persson teaming up with Niclas Frisk and Sparklehorse’s Mark Linkous. The follow up ‘Colonia’ finds Persson and Frisk hooking up with ex-Shudder To Think guitarist (and Persson’s husband) Nathan Larson. The album is already in the can and if lead single ‘Stronger Than Jesus’ is anything to go by it’ll be another melancholic country tinged affair highlighting Nina’s singular voice. Due out February 2. ‘Carnavas’ is an album I still can’t get enough. I think I saw these guys six times in 2007 and I’d go and see them six times again if I could. They were recording on and off between July and September last year so we should expect something sometime this year. Until then I’ll just have to make do with playing ‘Lazy Eye’ on Guitar Hero World Tour on the Wii. and once again the album will feature “brand new beautiful artwork” by Christopher Wilson. PJ Harvey and erstwhile collaborator John Parish have teamed up to record the follow up to 1996’s Dance Hall At Louse Point and is due out at the end of March on Island. I’m sure I’m not the only one who’s lost interest in Peej over the last couple of releases, could this be the one that wins us back? Zach Condon follows up 2007’s the Flying Club Cup with a double EP due in February. March of the Zapotec/Holland. Latest info says that part one of the EP will be under the Beirut name and was recorded with Mexican musicians The Jiminez Band, while part two is “bedroom style recordings” under Condon’s previous moniker Realpeople. The band are in the early stages of making the follow up to Boxer but it’s unlikely to see a release until 2010. But I mention them here as Aaron and Bryce Dessener have produced what has the potential to be an awesome compilation for the HIV/AIDS combatting Red Hot Organization. ‘Dark Was The Night’ features stellar cast of the indie great and good from Sufjan Stevens, Spoon, New Pornographers, Arcade Fire, Stuart Murdoch, My Morning Jacket, David Sitek and a shitload more. Check out the full details. The Baltimore based trio release ‘Merriweather Post Pavilion’, this Monday and have made an early punt for Hipster Album Of The Year. With tracks appearing all over the internet and new song ‘My Girls’ up on the band’s MySpace page this looks likely to grow their fanbase much more than 2007’s ‘Strawberry Jam’ with Pitchfork already giving it a 9.6 review and calling it more “accessible and complete” than their earlier work. Their Koko show on Monday is sold out but they’re back at The Forum in March. This entry was posted in A Camp, Animal Collective, Band Of Horses, Beirut, Silversun Pickups, The National by nickpeters. Bookmark the permalink.